Unused NOS Dual Readout 2 Row 18 Position Card Edge Connector w/Solder Eyelets. "Unused NOS Elco 5009-12 Single Readout 12 Circuit Card Edge Connector w/Solder Terminals. 12"" spacing." Neve 18-Pin Female Edge Connector For Vintage Modules, Used, Good Condition. Unused NOS Single Readout 1 Row 15 Position Card Edge Connector w/Solder Eyelets. "Unused NOS Dual Readout 2 Row 24 Position Card Edge Connector w/Solder Eyelets. Gold flashed terminals. Good condition. 0.156"" lead spacing. " Unused NOS Dual Readout 1 Row 20 Position Card Edge Connector w/PCB Terminals. "Unused NOS Dual Readout 2 Row 12 Position Card Edge Connector w/Solder Eyelets. Gold flashed terminals. Good condition. 0.156"" lead spacing. " Unused NOS Dual Readout 1 Row 30 Position Card Edge Connector w/PCB Terminals. Unused NOS Dual Readout 2 Row 50 Position Card Edge Connector w/PCB Terminals. Unused NOS Dual Readout 2 Row 43 Position Card Edge Connector w/PCB Terminals. Unused NOS Dual Readout 2 Row 28 Position Card Edge Connector w/PCB Terminals. "Unused 305 2963 103 96-Pin 3 Row .100"" Pitch 90 Degree Through Hole Male DIN Plug. " Unused NOS Dual Readout 2 Row 22 Position Card Edge Connector w/PCB Terminals. Unused NOS Dual Readout 2 Row 40 Position Card Edge Connector w/PCB Terminals. "Unused 305 2963 103 96-Pin 3 Row .100"" Pitch 90 Degree Through Hole Female DIN Plug. " "Unused NOS Dual Readout 2 Row 36 Position Card Edge Connector w/PCB Terminals. Good condition. 0.100"" lead spacing. Gold flashed terminals. 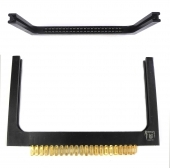 These type of connectors are very common on pro audio equipment and consoles." Unused NOS Single Readout 1 Row 35 Position Card Edge Connector w/Solder Eyelets. "Unused NOS Single Readout 1 Row 10 Position Card Edge Connector w/Solder Eyelets. Gold flashed terminals. Good condition. 0.156"" lead spacing. " Unused NOS Dual Readout 2 Row 30 Position Card Edge Connector w/PCB Terminals. Unused NOS Dual Readout 2 Row 15 Position Card Edge Connector w/PCB Terminals. "Unused AMP / TE 650470-5 96-Pin 3 Row .100"" Pitch Through Hole Male DIN Plug. Through hole mounting, gold flashed pins." Unused Berg 65483-001 20-Pin Gold 90 Degree Right Angle PCB Header. Unused NOS Single Readout 1 Row 18 Position Card Edge Connector w/PCB Terminals. "Unused NOS Dual Readout 2 Row 28 Position Card Edge Connector w/Solder Eyelets. Gold flashed terminals. Good condition. 0.125"" lead spacing. AMP Part No. 530664-6. " "Unused NOS Dual Readout 2 Row 6 Position Card Edge Connector w/Solder Eyelet. Good condition. 0.156"" lead spacing, for 1/16"" PC boards." Unused NOS Single Readout 1 Row 18 Position Card Edge Connector w/Solder Eyelets. 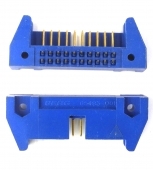 "New Vector R644 44-pin (22x2) Dual Row Edge Connector, .156"" Pin Spacing. " Unused NOS Dual Readout 2 Row 22 Position Card Edge Connector w/Solder Eyelets. 31-Way DIN 41617 Round Pin Edge Connector Socket For Telefunken Modules, Etc. Unused NOS Dual Readout 2 Row 28 Position Card Edge Connector w/Solder Eyelets. Unused NOS Dual Readout 2 Row 12 Position Card Edge Connector w/PCB Terminals. Unused NOS Dual Readout 2 Row 15 Position Card Edge Connector w/Solder Eyelets. "Unused NOS Dual Readout 2 Row 22 Position Card Edge Connector w/Solder Eyelets. Gold flashed terminals. Good condition. 0.156"" lead spacing. Vector Part No. R644. Please note you may receive a part with a different manufacturer but the same features."